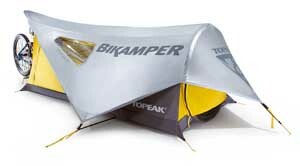 Topeak's Bikamper, The Perfect Mountain Biker Companion | OhGizmo! 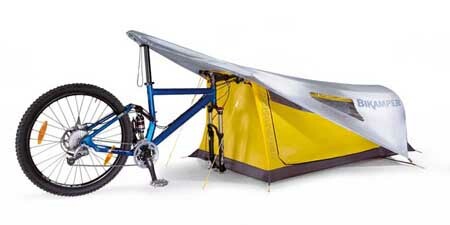 If you fancy going places with your mountain bike and you like camping, why not then just use your bike as the structure for your tent? Makes sense, no? Simply detach the wheel (it’s made specifically for 26″ wheels) and plop it in at one end. Then, use the rest of your bike as the structure for the other side. Just like that, you have yourself a one man tent. The canopy of the Bikamper is constructed of durable, waterproof coated 45D ripstop nylon and features three mesh windows for ventilation and stargazing on pleasant nights. The Bikamper fly is constructed of fully waterproofed 70D ripstop nylon to offer an additional layer of protection. Both tent and fly pack down to a small, space saving size. Prices were hard to find, but some digging produced this Australian online store that sells it for $349 (I don’t know what kind of dollars those are though) and another one lets it go for £143.99, which is about $260 (USD this time). Story VIA The Cool Hunter. True, it would be better supported, but I do have a slight problem with digging my shifters into the mud. Or the seat of the bike, for that matter. This set-up even keeps the seat and handle-bars nice and dry if it rains. Sure, I have a one-man tent that is four-season and cost about the same, and it’s pretty freakin’ small, but without poles? This thing *has* to be even smaller and lighter than what I have. Neat idea. I’d be uncomfortable about having to support the bike on the front fork every night, and leaving the rear derailleur exposed to the elements. There are some 1-person backpacking tents in the 4-5 pound range that have vestibules large enough to completely enclose a bicycle. ?? ?? ??? – ?????? ???? The front fork actually mounts into an axle with stakes built in, this combined with two nylon cords that also get staked into the ground makes it rather stable, even in a strong breeze. Weight wise it compares pretty good with other products in the price range, and the materials and construction are on par as well. it really nice to see such a wonderful design. its really the first tine we kenyans have seen a tent like so, it so much usefull for outdoor / camping purpose.Keep it up !!! Does anyone here know what you have to do if you want to leave the bikamper up while you go off for a days riding? Tis the only thing that bothers me about this tent you see.